Amos Kenan (1927-2009) was born in Tel Aviv. He was a member of the anti-British military underground movement but became known as a political dove soon after 1948. In the 1970s, Kenan co-founded the Israeli-Palestinian Council. 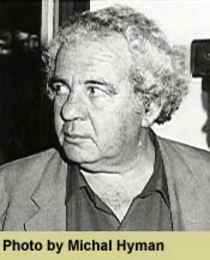 A leading newspaper columnist, he wrote for the popular Yedioth Ahronoth and was also a painter, sculptor, playwright and novelist. Kenan was awarded the Brenner Prize in 1999.